← Chibi Pushodigy/L2 Treibball Title! Following up to my previous post on the Tasks of Chibi’s Level 2 Title from World Treibball League, this post provides clips to the tasks of Chibi’s Level 1 / GLOBAL GIZMO Title. Level 1 / GLOBAL GIZMO has 3 Tasks. There are 4 Balls on the playing field. Goal / Handler’s Area is 10′ wide. No food or toys allowed during play. 1 minute per Task. Senior/Small Dog exemption = 1.5 minutes for Tasks 2 and 3. TASK 1 Level 1 – With dog off-leash, Team heels around the balls “weaving through, around and by the balls, diagonally, in a circle, back and forth. All four balls must be passed or circled WITHOUT the dog interacting with them in any way.” Task 1 has no pushing. TASK 2 Level 1 – 4 sends (2 counter, 2 clock), each with a 5 second wait, call dog back, no pushing. TASK 3 Level 1 – 2 sends (1 counter, 1 clock) each with a 5 second wait before pushing. I hope FOXMESA’S RED CHARM QUARK RN VBS PL2 GGL1 inspires you and your dog to Get Pushy. 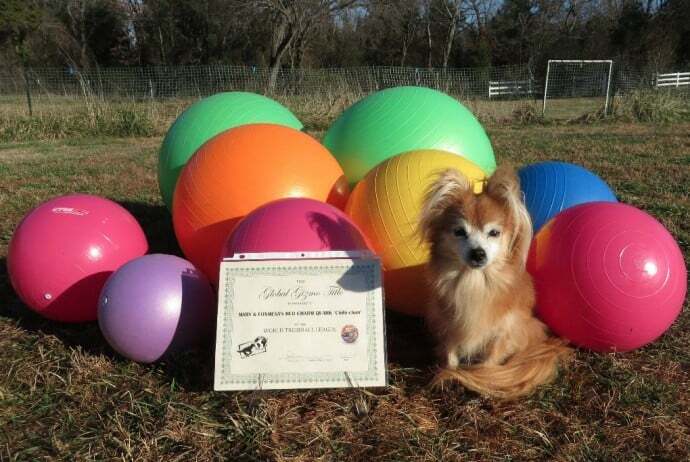 🙂 If you live in the Van Buren, AR (USA) area, join us at SMART DOGS for Treibball Class. Thanks to WTL/Nancy for all the fun! For full details, see World Treibbal League Titling Levels.